Is it possible to use non-certified hard drives in a Dell MD3220 storage array? I ended up getting 3 new drives that were the EXACT same model number as the existing ones. Then I bought the drive caddies to go with them. Once the new drives arrived I mounted them on the caddies and inserted them into my storage array to see an Incompatible status. They have all the same specs. The only difference is the firmware. Still oblivious as to what was going on I started the standard process of upgrading the firmware. 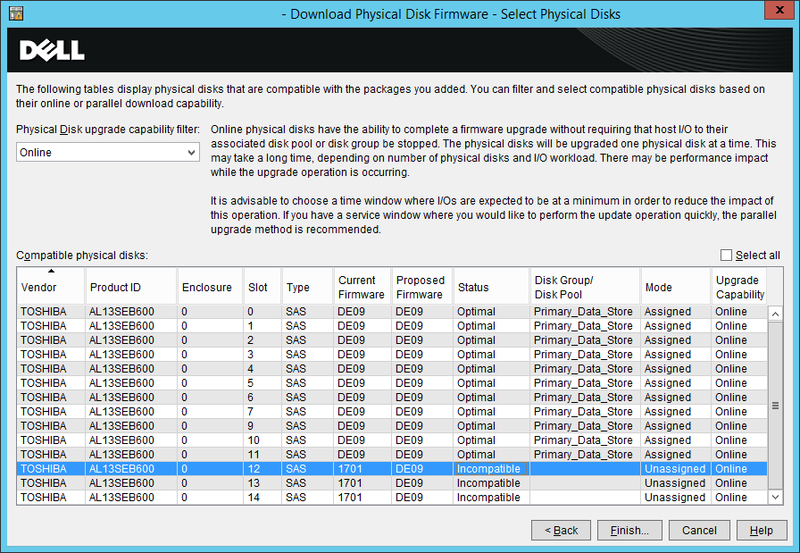 The firmware on the drives I received was 1701 and all my other existing drives were DE09. After looking into it on the web it seems that it's a common practice for vendors like Dell to lock down their software to only support DELL BRANDED hardware! Even though the drives are the exact same drive (same model and everything both made by Toshiba). Now I'm stuck with these three drives that I only bought because Dell wouldn't sell them to me (I guess they no longer make them). Not to mention the caddies I bought elsewhere. My question is, is it possible to somehow flash the firmware on these drives so that Dell's software/hardware will accept them? Just to add if it helps others, I wanted to post where I was able to find the firmware for my drives. Dell does not make it easy to get to. I had to check each version release of the firmware packs to find the firmware I needed for my drive. Suggestion, don't download each one, use the README (they include for each firmware pack) to search for the firmware you are looking for then download the large pack of firmware. Mine happen to be A19 that contained the DE09 firmware I was looking for. 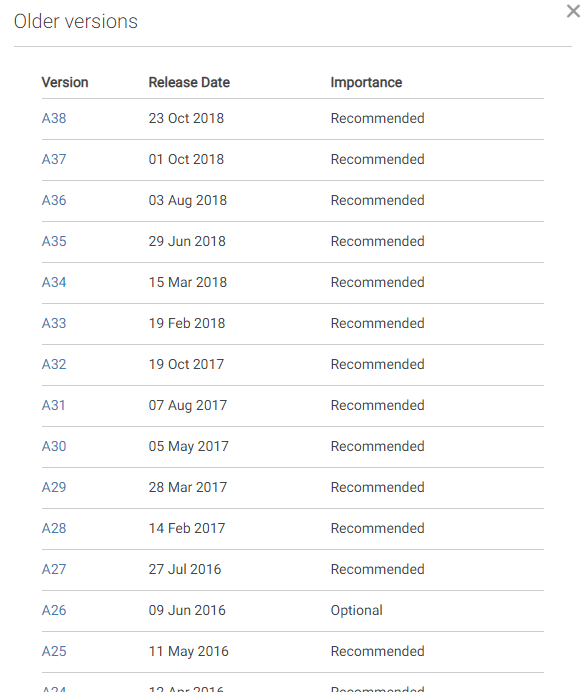 You will need to look at each one to determine what package (in my case A19) that you need to download. Well it has been a few days now and my struggle continues. Even with the help of @Freddy's answer I'm still trying to make this a reality. It gets past the device ID check to green light my disk. Before, the firmware would check for id 29747 (AL13SEB300) or id 29748 (AL13SEB600) or id 29749 (AL13SEB900). My drive was showing up as id 00000 (AL13SEB600). So I edited the FW to account for the 00000 id. This worked great! It bypasses the minimum required firmware version (because my new drives have version 1701 on them) before it tries to update. 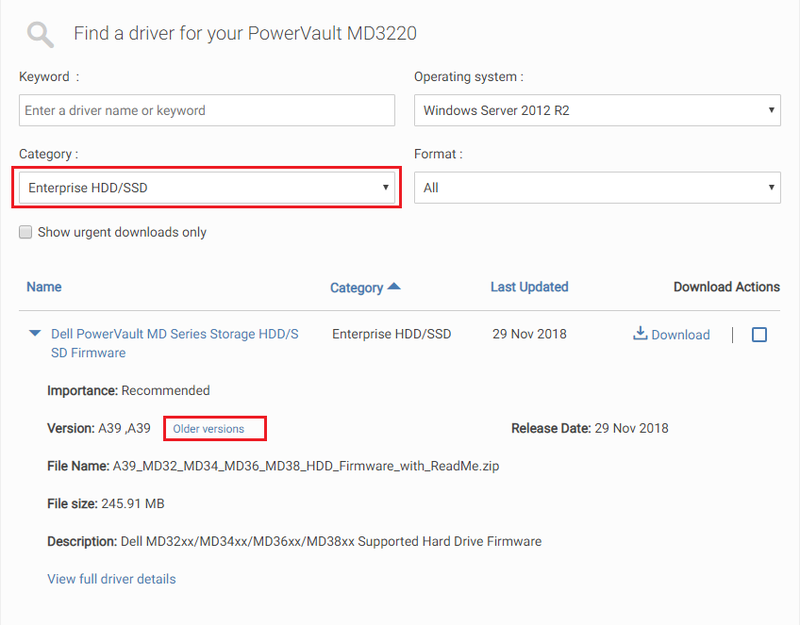 So now instead of looking at drives with firmware DE01 and above, it looks for drives with 1701 and above (because version 1701 is lower than DE01). Error Code: "WriteBuffer: Return code from ProcessLibCommand = 2d." This is the normal way that Dell wants you to update the firmware. It takes firmware packages (*.df) such as Toshiba_AL13SEB600_DE09.df. I thought that I could try to just hack the firmware and use this tool to update the drives. But with this tool it first reads the drives and determines that are in Bypassed or Offline status and make the drives inaccessible. This happens before you can even get to the Download Physical Disk Firmware window. So unfortunately this was a bust. This is a tool that can be downloaded from here. It allows you to create a bootable CD or USB thumb drive. You can then boot the CD/USB up to upgrade the drives in a non windows environment. Unfortunately this would not work for me either. When I booted up my R630 Dell server which has a boot drive that's mirrored (2 x 600GB drives), and a data drive (not currently used) that is running a raid 5 array from 4 drives, and has connections to my MD3220 storage unit of course. That makes a total of 6 drives mounted into the R630 server and then I have one I inserted (then set as a NON-RAID drive) to flash the firmware on. When booting up this utility it seems to only show me 4 drives, and two of those drives are the same drives just from different controllers. I have no clue why it's not showing me all the drives. But this does not seem to be working for me at all. I found a tutorial. Please read Flash Dell Firmware into Seagate Generic Drives. The procedure should be the same for your Toshiba drive as the same tools are used. Dell download page: Toshiba SAS AL13SEB300, AL13SEB600 and AL13SEB900 firmware version DE09. FYI: There is also a newer firmware DE11 available (not tested by me). I tried to install the 64bit windows package which successfully failed on my lenovo laptop, but I could find the extracted files in my win10 temp dir (C:\Users\ibm\AppData\Local\Temp...). Provides inventory information of all identified devices. -o Specifies the output filename. -debug Specifies to create a debug log file. -f Specifies to download if the same or a newer version is installed. filename is debug.log in the current folder. According to Dmitri Bobko's manual you should replace "29748" (for AL13SEB600) with the hardware id detected by SASDUPIE.exe -u -s "%cd%\payload" -f -o update.xml -debug debug.log (edit: make sure you run cmd using "Run as administrator") and also replace "DE01" (bytes 14-17=minimum required fw version) with your current firmware revision "1701". After running the command I could find in debug.log where the fw update would have been triggered (if I had matching hardware). <Thu Jan 24 01:32:48 AM>DUPWrapper:No devicea updated. <Thu Jan 24 01:32:48 AM>DUPWrapper:Deleting ImageLoader. Not the answer you're looking for? Browse other questions tagged hard-drive storage-area-network dell-openmanage dell-powervault or ask your own question. 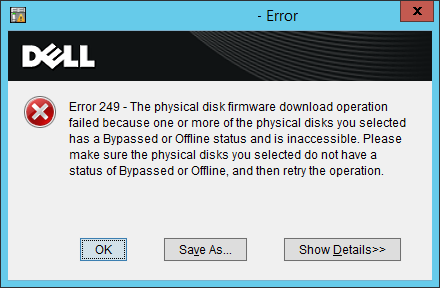 What app in Dell firmware update actually writes the firmware to disk? Does Dell Permit 3rd Party Hard Drives on Perc 6/i?